With small leaves and a dense growth habit, Lonicera nitida commonly called the ‘Boxleaf Honeysuckle’ or ‘Dwarf Honeysuckle’ is used as an evergreen hedging plant. 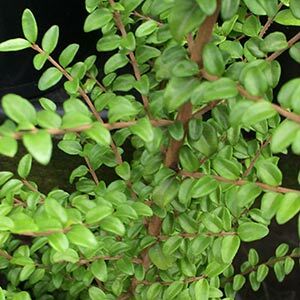 Best grown in full sun to a little shade, Lonicera nitida should be planted with a spacing of 60cm for a tall hedge of 2m, closer spacing for a lower growing hedge is recommend. Prepare soil well and set up a string line for accurate planting. Did holes at about twice the size of the root ball or pot size. Add a little slow release fertilizer to the planting hole. Mulch around the newly planted hedge to maintain moisture and a cool root run. Prune or trim the plant to encourage strong bushy growth. Pruning can easily be carried out with electric hedge trimmers and is best done at regular intervals. Although Lonicera nitida can reach 1m in height in a single year, formative pruning and training when first planted will produce the best results. We suggest pruning lightly when first planted and each 3 months during the growing season. Fertilize in spring with an all purpose slow release type fertiliser. Landscaping uses for ‘Boxleaf Honeysuckle’. Mostly used as a hedging plant Lonicera nitida can also be used for Topiary. It grows well in containers and is easy to maintain. Excellent for smaller hedges and detailed topiary work. Common Names – Dwarf Honeysuckle or Box Leafed Honysuckle. Height – To 3m, usually pruned lower. Width – To 3m, often pruned to 1m in width. Growth rate – Fast often from 70cm to 1m a year. Soil – Well drained is essential. Humus rich for best results and growth, however will cope with poor soils. Moisture – Will require some extra water during long dry summers.